The intention of the software is to provide the Marine Search and Rescue Community with some handy calculators that can be used on SAR missions. The App is optimized for portrait orientation on an iPhone and has not been tested on a tablet. Improvements: You can edit individual data values on the "Find a Location" screen by pressing on the degrees, minutes or decimal value for both latitude and longitude. Entered search values are saved when the App is restarted or screens are switched. New search log feature. More streamlined user interface. - Sector Search Timer and Calculator. Can run two full circuits of 9 legs with a 30 degree course change to start the second circuit. User enters search speed and search radius, and everything else is calculated automatically. Timer defaults to 0 degrees for the first leg but any value can be entered. Once timer is started, it signals when to turn with the appropriate heading. 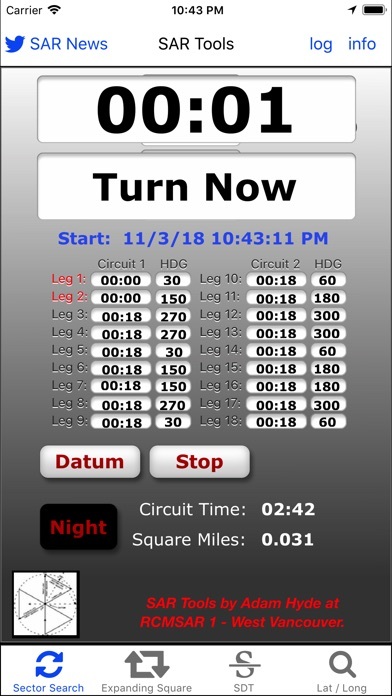 Timer must be reset when you pass back through datum. Total search time and area are also shown for one circuit. Start time is logged so that it can be transferred to a log book later. - Expanding Square Search Timer and Calculator. Runs a full expanding square search with 18 legs. User enters search speed and search radius Timer defaults to 0 degrees for the first leg, but any value can be entered. Once timer is started it signals when to turn with the appropriate heading. Search can be paused and then restarted at the beginning of the last leg you were on. 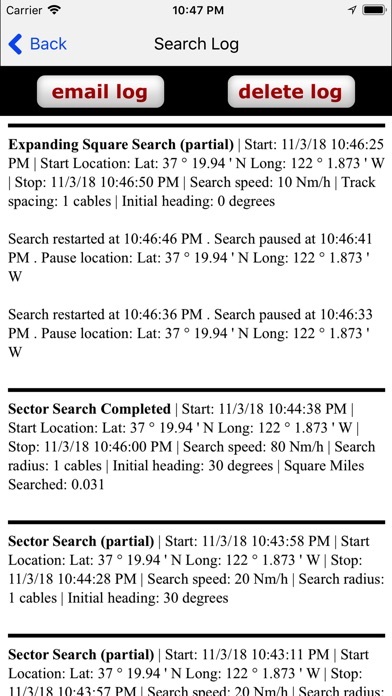 Total search time and area are also shown for the search. Start time is logged so it can be transferred to a log book later. 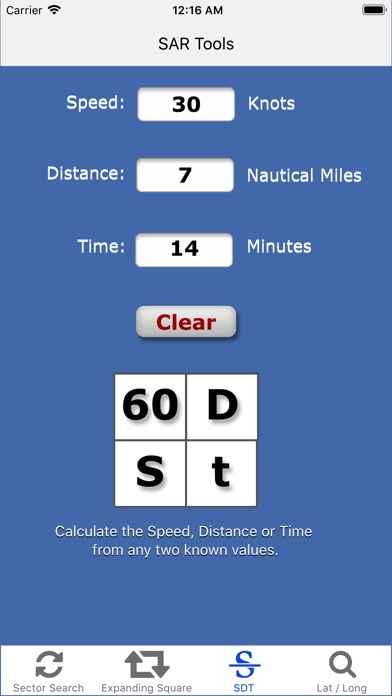 - Speed, Distance, Time Calculator. Enter any two parameters and it calculates the third. - Find Lat / Long functionality allows you to quickly enter a lat / long and the App will calculate your distance (as the crow flies) along with bearing and also show your current location. You can also automatically map the lat / long entered on google maps. - Search Log automatically keeps record of all the parameters of your searches and allows you to email the log file to anyone you choose. - Night Mode. Sector and Expanding Square Search Calculators have a night mode to preserve night vision. - Vibrate. Timers vibrate in the hand when it is time to turn. - Help. Help is available for Sector and Expanding Square Search Calculators. Published by Adam Hyde of the Royal Canadian Marine Search and Rescue (RCMSAR). Pleasure Boaters should download RCMSAR's "Safe Boating" App on iTunes.